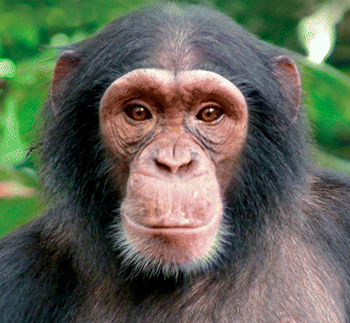 Chimpanzees (Pan troglodytes) can be found from southern Senegal across the forested belt north of the Congo River to western Uganda and western Tanzania. They live in fission-fusion societies of up to 150 individuals, splitting up into small groups when traveling or foraging during the day and coming back together to sleep at night. There is a distinct linear dominance hierarchy in male chimpanzees, and males are dominant over females. They are generally fruit and plant eaters, but they also consume insects, eggs, and meat. 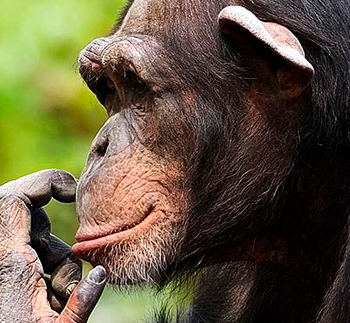 Chimpanzees employ tools to gain access to food. Chimpanzees groom each other daily, and this activity has important social functions such as calming individuals and solidifying their bonds with each other. 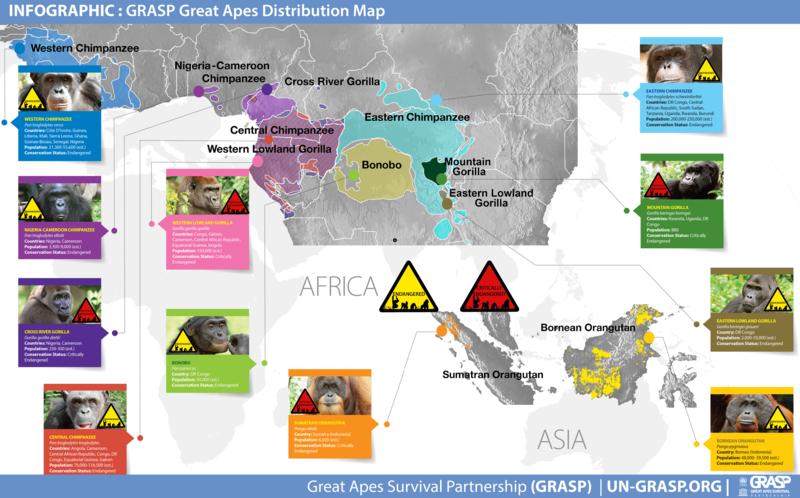 GRASP & IUCN (2018). 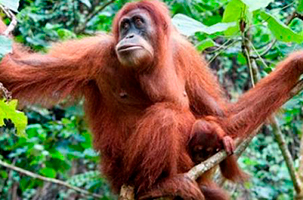 Report to the CITES Standing Committee on the Status of Great Apes. UN Environment, Great Apes Survival Partnership, Nairobi and International Union for Conservation of Nature, Gland. The characteristic chimpanzee shape includes arms that extend beyond the knees, opposable thumbs, and a prominent mouth. Chimpanzees’ arms are longer than their legs. The skin on the face, ears, palms, and soles of the feet is bare, and the rest of the body is covered with coarse brown to black hair. Infant chimpanzees have very pale brownish skin on their faces, ears, palms of their hands, and soles of their feet. Infants also have a white tail tuft that disappears by early adulthood. Male chimpanzees weigh between 40 and 60 kg (88 to 132 lb) against 32 to 47 kg (70 to 104 lb) for females. Head-body length (from the nose to the rump while on all fours) ranges from 63 to 94 cm (2.1 to 3.1 ft). While standing, males can measure up to 160 cm (5.2 ft) tall and females up to 130 cm (4.3 ft) tall. Chimpanzees have a wide but discontinuous distribution in Equatorial Africa, from sea-level to 2,800 m above sea level. The subspecies are distributed as follows. The Western chimpanzee is found in West Africa from Senegal to Ghana, and possibly also in western Nigeria. 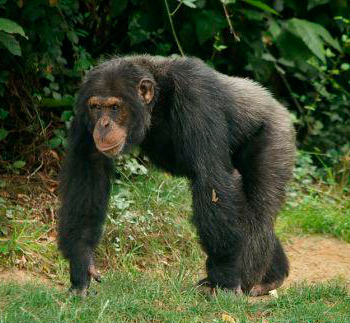 The Nigeria-Cameroon chimpanzee is found only in Nigeria and Cameroon, north of the Sanaga River. Central chimpanzee distribution ranges from Cameroon, south of the Sanaga River, to the Congo River/Ubangi River (DR Congo). The Eastern chimpanzee is found from the Ubangi River/Congo River in Central African Republic and DR Congo, to western Uganda, Rwanda, and western Tanzania (with small, relict populations in Burundi and South Sudan). 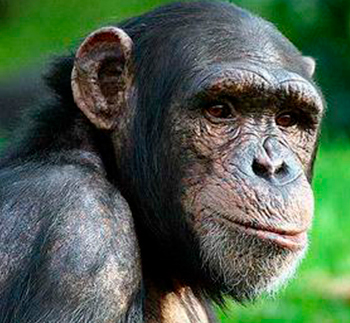 Female chimpanzees reach reproductive age at 13 years of age, males at around 16 years of age. Mating occurs throughout the year and there is no evidence of a birth season, although there is seasonality in the number of estrous females in a group relating to food abundance. The gestation period is around 230 days, and chimpanzees typically give birth to a single infant. The survival and emotional health of the young is primarily dependent on maternal care. By 4-6 years of age, chimpanzees are weaned and infancy ends. Juveniles, 6-9 years of age, remain close to their mothers, but they also have more interactions with other members of their community. The lifespan of a wild chimpanzee is 40 to 45 years. Visit the Lwiro Primate Rehabilitation Centre, where orphaned and confiscated primates from across the region are cared for and, where possible, returned to the wild – South Kivu, DR Congo. 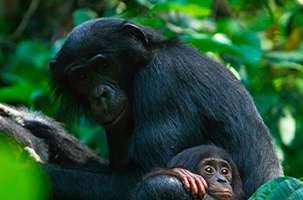 Bonobos (Pan paniscus) are largely peaceful, frugivorous great apes found only in DR Congo that live in highly complex, fission-fusion societies. 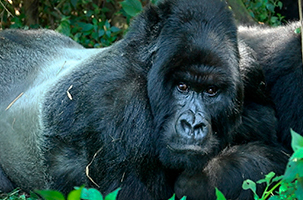 Gorillas (Gorilla gorilla and Gorilla beringei) are ground-dwelling apes occupying a variety of different habitats and elevations in central African forests. Native to Malaysia and Indonesia, orangutans (Pongo pygmaeus and Pongo abelii) are found only on the islands of Borneo and Sumatra.